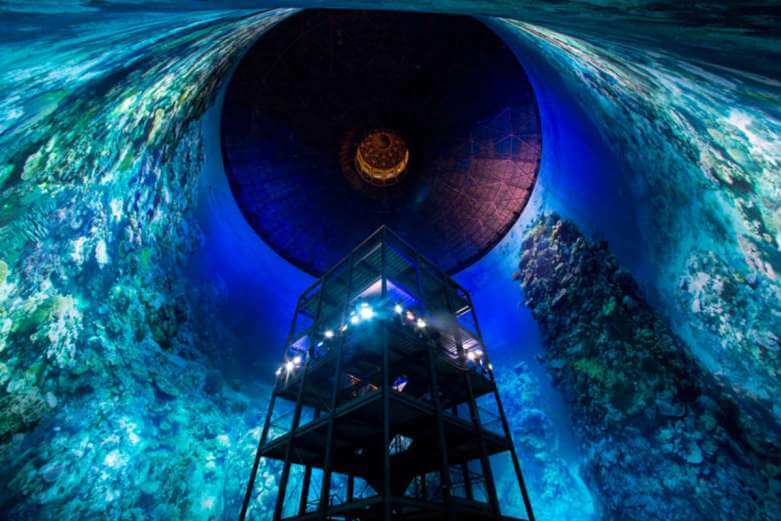 There’s an ocean inside an enormous gas storage tank in Leipzig, Germany. For the past 12 years, artist and architect Yadegar Asisi has been operating the space as a platform for his large-scale panoramic works. The art is projected onto the structure’s cloth-covered walls, which are 100 feet high and 360 feet in circumference. The result is a to-scale panorama that overwhelms and immerses the viewer. And while creating experiences on this scale has been interesting for some of Asisi’s past projects, it could be critical for the Great Barrier Reef, the subject of his newest work. Right now, corals all over the world are dying at an unprecedented rate, and their disappearance could hasten the destruction of one of the planet’s most diverse ecosystems. Catching a prolonged glimpse of such a productive reef is getting increasingly difficult—and, unless we take drastic action to slow the pace of global warming, it may someday be impossible. Though Asisi doesn’t explicitly express a conservationist perspective to the art, it’s not hard to imagine that it could have that effect—his work can elicit awe and respect in viewers who have never seen a reef up close, and might just inspire them to take action toward saving it. Asisi’s work will be on display until September 2016.